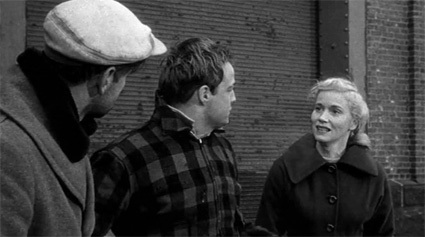 Elia Kazan's "On the Waterfront" has been discussed endlessly by film fans, critics and film historians. 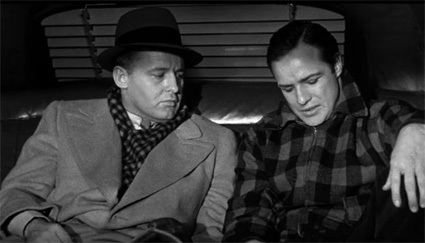 It's easy to see why, for "On the Waterfront" can be studied from various perspectives. On the one hand the film reflects a time in history when some Americans named names before the House of Un-American Activities Committee much like Terry Malloy does in court. It has also been argued to be Kazan's answer to Arthur Miller's play "The Crucible" or his redemption and justification for falling victim of Joseph McCarthy's witch-hunt of the 1950's. Robert De Niro performs the same speech in Raging Bull. 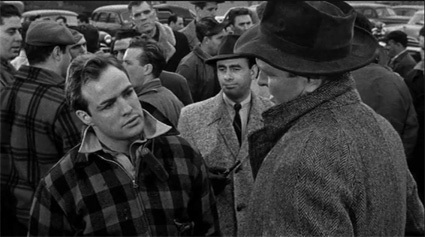 Others simply revisit the film to study its significance in film history and the impact of Brando's method acting. Pauline Kael recognized strong Christian symbolism in the plot and looked at the film from a religious point of view. 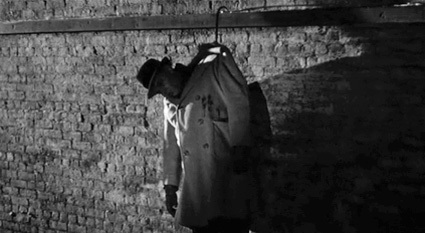 Among other things a lawsuit filed against Columbia pictures in 1955 revealed that the film was also a true story based on Anthony De Vincenzo who with the aid of waterfront priest John M. Corridan blew the whistle against the corruption imposed by real life mobster Albert Anastasia. The way I see it, all the above facts tell the story behind the film. It's a shame that the religious, socio-political or historical agendas that went on behind the curtains eclipse every other essay written about this great story. So I tried to strip everything I read and learned about the film from my mind and study it with fresh eyes. It's almost impossible to do so, yet I managed to see the film in a new light. The one film essay that occupied my thoughts during my attempt to recapture a first viewing is Roger Ebert's brilliant "Raging Bull" review. 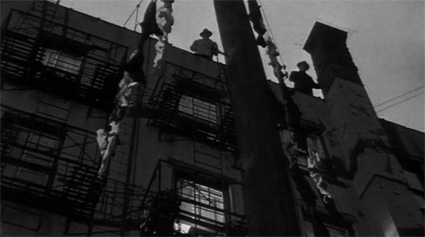 Both films are black and white motion pictures with boxers as protagonists. Another thing they share in common is the fact that in both movies gangsters cast their greedy shadows influencing and manipulating the outcome of boxing matches. Nonetheless, on a cinematic level they couldn't be more different, or so I thought. 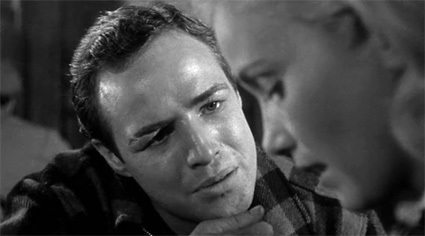 The only direct connection they share is the referenced "I could've been a contender" quote, but through Roger's essay I discovered a new angle to "On the Waterfront." In my personal favorite film review, Roger points out that "Raging Bull" is not about boxing at all but rather about "a man with paralyzing jealousy and sexual insecurity, for whom being punished in the ring serves as confession, penance and absolution". In other words, the film appears to be about boxing on the surface, but on a deeper level it is about something entirely different. 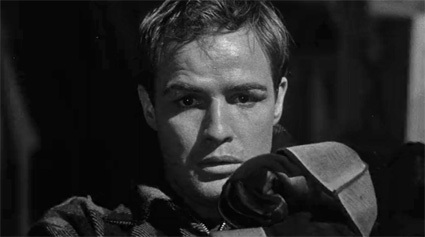 It is no coincidence that I kept thinking about his words during my latest "On the Waterfront" viewing, for it also is a film that hides behinds a genre--only, unlike "Raging Bull," it's the other way around. 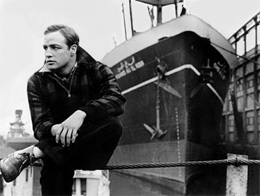 Think about it, "On the Waterfront" doesn't quite fit in as a gangster picture the same way "Raging Bull" doesn't feel like a boxing film. 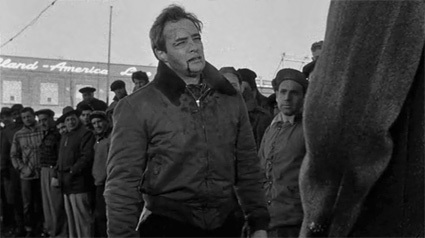 Even though there's not a single scene where sluggers dance around within the confines of a ring, Kazan's film is in fact a boxing film in disguise. 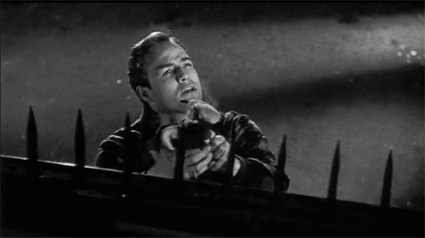 The film starts off with Terry Malloy (Marlon Brando) trying to get Joey Doyle to meet him on the roof after having found one of his lost pigeons. 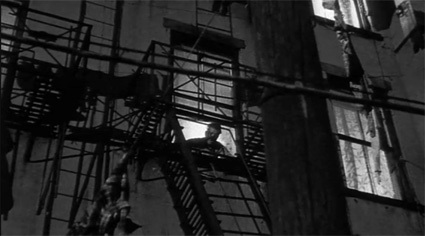 We learn that Joey is wanted by the mob but he goes up the roof nevertheless. We sense he trusts Terry. Unfortunately the whole act turns out to be a set-up. Gangsters throw him off the roof to his demise. 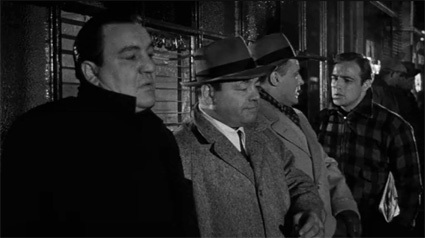 We see Terry's reaction as he stands on the sidewalk next to his brother Charley and two other gangsters. Clearly Terry is upset. "I thought they was gonna talk to him and get him to dummy up. I figured the worst they was gonna do is lean on him a little bit," he tells his brother. We later learn that this wasn't the first time Charley used his kid brother for his own benefit. Gradually we witness Terry struggling to pick a side. 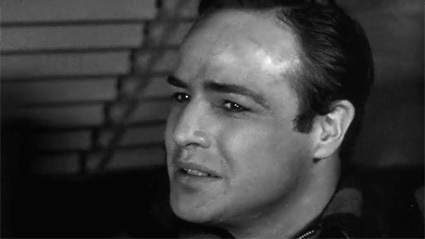 No other actor could better express a slow and continuing character change as Brando. 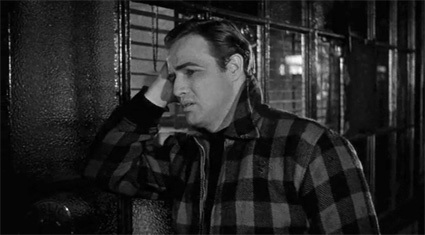 When he learns about Doyle, Brando plays with his jacket zipper and we suspect something is troubling his mind. 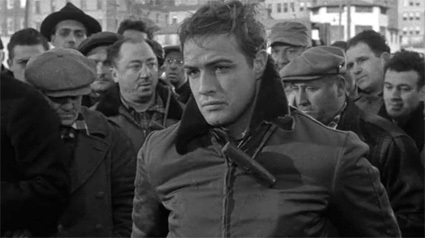 Brando's use of body language in "On the Waterfront" is as clear as the expressive acting of the silent era. It's hard to pinpoint when exactly he changes as several people contribute to him taking a stand against the mob. Joey's Doyle's sister, for one, plays an important role in this transformation for she feeds his guilt. They first meet on what seems to be like any other day on the waterfront. Two detectives mingle in the crowd asking for Terry Malloy. When they finally spot him, one of them asks Terry about his boxing days to which Terry replies, "Ok. Ok. Without the bird seed, what do you want?" They start asking about Joey, since Terry was the last one to see him before his death. 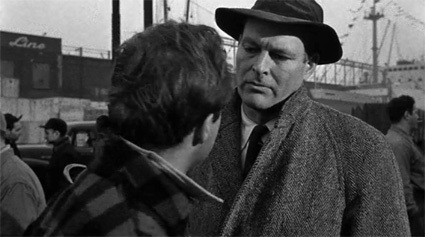 A longshoreman's hook rests on Terry's shoulder while he gives them nothing they could work with; the hook of course symbolizes being hooked in a corrupt system. Afterward Terry looks to one of his friends and says "How do you like them mutts taking me for a pigeon?" 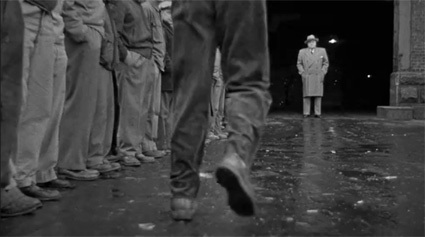 A whistle blows and the men gather up around one of the gang members who's about to pick the workers of the day. The longshoremen are desperate. They start begging and pushing, the man finally gives up and throws the tabs on the floor. Dozens of men scramble fighting for the tabs like pigeons would react to bird seeds on the ground. Oh, the irony. Anyway, Terry meets Edie there and after he learns that she's Joey's sister he gives her his tab. The more time he spends with her the guiltier he feels. Notice how during those scenes Terry is wearing a checkered wool jacket. His entire presence changes throughout the film; the costume design is deliberate with two contrasting colors representing the conflict within him. Eventually Terry wears Joey's jacket. It's plain because by then he has already picked a side. 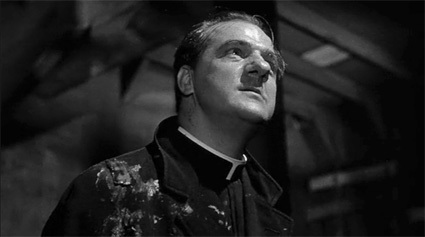 This leads me to another important character in this film, Father Barry. 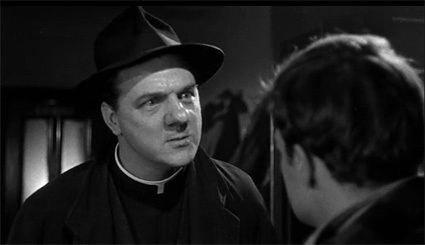 Father Barry (Karl Malden) pushes Terry a step further during one his speeches. He goes on and on trying to convince the longshoremen to act. Meanwhile, we see a change occurring in Terry's eyes. When one of the mob members attempts to throw something at the priest, Terry knocks him out. The way Father Barry words his speech is almost like he indirectly wants to spark that fire in Terry. He uses words a boxer could identify with. "What they did to Joey, what they did to Nolan, they're doing to you. And you. And YOU. And only you, with God's help, have the power to knock 'em off for good!" Terry needs the priest like a boxer needs a trainer. 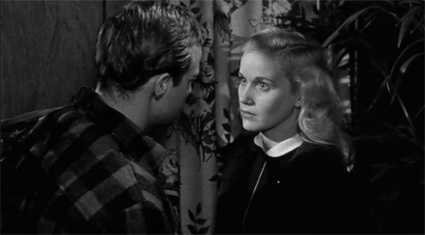 As much as Edie and Father Barry influence Terry's actions to finally take a stand, I believe it's his brother Charley (Rod Steiger) who finally pushes him over. 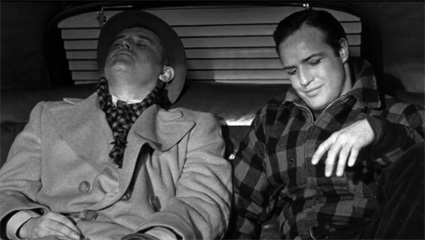 In one of the most iconic acting scenes in cinema, Terry meets his brother in a cab. Charley pulls a gun on his brother and for the third time he tries to force his own brother into doing something he'd rather not. Terry pushes the gun away in disappointment. "Charley, Charley, Charley," he says in a heartbreaking tone. His brother, realizing what he has done, rests his head in shame. I think this is the precise moment when Terry decides to face the mob. He fiddles with a piece of dust on his leg. "Oh, Charley." Throughout the film you can sense an awkward uncomfortable chemistry between the brothers and it all comes down to this scene. 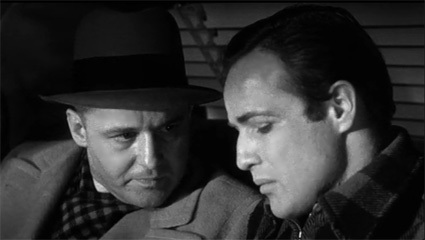 Both Brando and Steiger bare their souls here. Great acting scenes rarely live up to their hype but every single time I watch this scene, the pain that pours out of both of them never fails to move me. As mentioned before this is where we learn how Charley first selfishly used his brother in the past. "It wasn't him, Charley, it was you. Remember that night in the Garden you came down to my dressing room and you said, 'Kid, this ain't your night. We're going for the price on Wilson.' You remember that? 'This ain't your night!' My night! I coulda taken Wilson apart! So what happens? He gets the title shot outdoors on the ballpark and what do I get? A one-way ticket to Palooka-ville! You was my brother, Charley, you shoulda looked out for me a little bit. You shoulda taken care of me just a little bit so I wouldn't have to take them dives for the short-end money." Terry finally opens up and tells his brother how that made him feel and ends his powerful speech with "You don't understand. I coulda had class. I coulda been a contender. I coulda been somebody, instead of a bum, which is what I am, let's face it. It was you, Charley." Charley can't even look him in the eye during all this. Both shameful and heartbroken he accepts Terry's decision. Terry isn't the only one who comes out of the cab incident a changed man. I always saw Charley as an overlooked character for this is his redeeming moment. 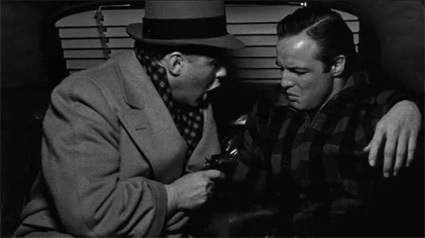 Charley hands his brother a gun before dropping him off. He's looking out for his kid brother and as we later learn, it's more than just a "little bit", for Charley sacrifices his own life for Terry. When Terry tries to avenge his brother's death it's the priest who saves him and directs him like a trainer would in a ring corner. "Don't fight him like a hoodlum down here in the jungle. That's just what he wants. He'll hit you in the head and plead self-defense. 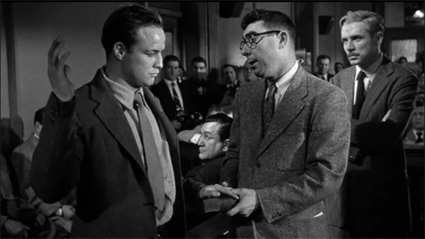 Fight him tomorrow in the courtroom" Terry testifies against the mob but loses everyone. Yet, he still finds the courage to go to the waterfront the next day. He lifts the longshoreman hook on his shoulder and throws it at the closed door of Johnny Friendly's office symbolizing his liberation. One thing leads to another and before you know it they're fighting one another. 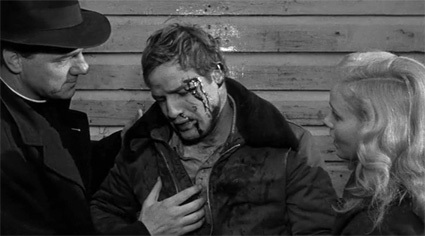 After the other hoodlums aid their boss, it's too much for Terry and he gets knocked down. This is the championship match he longed for. Thousands of longshoremen are watching like boxing fans gathered around a ring. It's Terry's only chance to prove he's not a bum. The priest comes as a trainer would at such a critical moment, "You hear that, Terry? Terry, did you hear that? You lost the battle but you have a chance to win the war. All you gotta do is walk... Johnny Friendly is layin' odds that you won't get up." This is the last round in a boxing match. Everyone is tense waiting to see if he has it in him to stand back on his feet. Terry struggles to get back on his feet but eventually he manages to do it. When someone tries to help him walk, the priest yells "Leave him alone. Take your hands off him. Leave him alone." Terry has to survive this walk on his own. Eventually Terry proves himself no bum bringing an end to the reign of corruption on the waterfront. Terry Malloy's a contender, he's somebody and he most certainly has class.